The ability to better detect and assess bacteria linked to a form of pneumonia prevalent in hospital intensive care units (ICUs) could soon become possible, according to research reported in the latest issue of the Journal of Biomedical Optics. The journal is published by SPIE, the international society for optics and photonics. Andrew Heidari and other researchers at the University of California Irvine, the Beckman Laser Institute, and N8 Medical demonstrated that optical coherence tomography (OCT) can be used to determine the presence of biofilm—bacterial growth that results from the attachment and subsequent multiplication of microorganisms to a synthetic surface. Biofilm has been linked to ventilator-associated pneumonia (VAP), which is a prevalent infection in hospital intensive care units (ICUs). Using OCT, the team was able to visualize and assess the extent of airway obstruction from biofilm deposited on intubated endotracheal tubes in vivo. "This is a newsworthy application for those working in the ICU," said David Sampson of the University of Western Australia. "Infection is an ever-present risk, and an easier way to check for biofilm could see such checks done more often and infection rates lowered, which would be a great outcome." The current method for biofilm characterization utilizes scanning electron microscopy (SEM), a lengthy process that requires extracting a sample, drying it, and coating it with a thin gold layer, none of which can be performed in vivo. OCT, on the other hand, is a noninvasive imaging technology that can provide high-resolution cross-sectional images of various biological samples, and can be adapted to provide three-dimensional volumetric information. In this study, extubated patients' endotracheal tubes were imaged using both OCT and SEM. Biofilm was present in both images, and the researchers were able to use the OCT image to measure a reduction in endotracheal inner lumen area between a 1-day intubation sample tube and a 5-day sample tube. 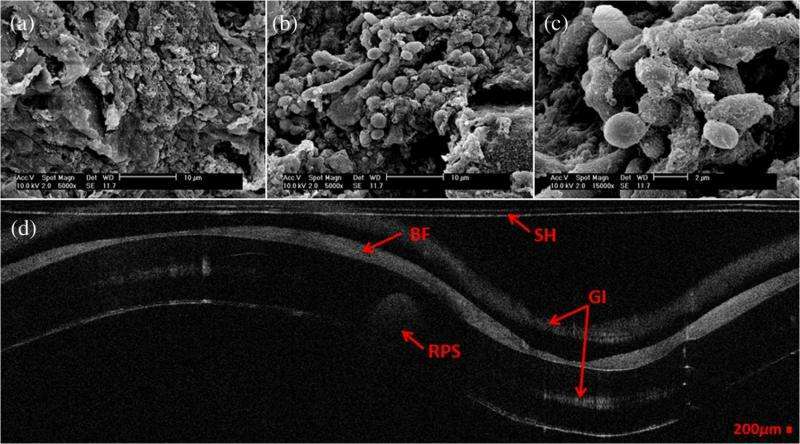 The study showed that OCT can be used to both detect the presence of biofilm and gather further information about the extent of biofilm formation from the thickness of biofilm observed. In the future, the research group plans to use OCT images to analyze the thickness and structure of the biofilm at which intubated patients in the ICU contract VAP.